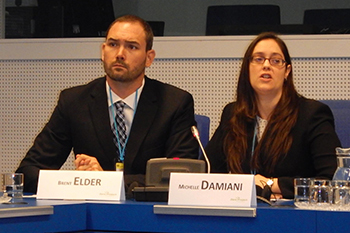 Two School of Education special education doctoral students, Brent Elder and Michelle Damiani, presented at the 2016 Zero Project Conference, convened by the Essl Foundation, the World Future Council and the European Foundation Centre at the United Nations Office in Vienna. The conference was held from Feb. 10-12 and highlighted 98 innovative policies and practices concerning inclusive education from 500 contributors representing 70 countries around the world. Elder and Damiani have each earned a Certificate of Advanced Studies (CAS) in disability studies from the School of Education. As part of this interdisciplinary program, they took law courses from Arlene Kanter, director of the College of Law’s disability law and policy program. Kanter introduced them to Judy Heumann, the special advisor for international disability rights for the U.S. Department of State, at a disability law symposium in Baltimore in 2013. Heumann encouraged them to pursue their interests in sustainable inclusive schools, and remained in touch. Elder taught special education for eight years at a public elementary school in Goleta, Calif., before applying to the School of Education doctoral program. He worked in Bahrain, Thailand, Belize, Cuba and Kenya during his breaks from teaching, and realized he wanted to work on international projects. He is currently conducting his dissertation research on a Fulbright award in rural Kenya. Damiani’s research agenda reflects a sustained commitment to inclusive teacher education practice and universal design for learning. She is a 2013 recipient of an outstanding university teaching assistant award. “Presenting our work at the United Nations among so many world leaders, who share a global commitment to inclusive education and a barrier-free world was most impactful,” says Damiani. Joanna Masingila, dean of the School of Education, invited Elder and Damiani to travel to Kenya 2013 to conduct a series of workshops focusing on inclusive teaching strategies for a group of teachers in rural Kenya, the basis for their paper and presentation. She says that the School of Education is extremely proud, and encourages other interested students to pursue doctoral studies in the area of special education. The School of Education has been consistently ranked in the top 15 nationally for its special education graduate programs. Elder and Damiani are invited to a meeting of disability experts at the World Bank in April. Elder believes that these opportunities will help him develop transnational projects in the future, to encourage inclusive education for students with disabilities around the world; while Damiani feels that she learned about other areas of need in her work, for example innovative practices around inclusive education in emergency and refugee situations. The article they submitted to the UN has recently been published in the International Journal for Inclusive Education: http://www.tandfonline.com/doi/abs/10.1080/13603116.2015.1082648.